Your first visit to the Clinic will need to include a number of the procedures listed below. To allow time for these your first appointment will usually last for 45 minutes. Further appointments will last for 30 minutes. The charge for your first visit will be the same as each subsequent visit. You will be asked a series of detailed questions about your general health and your specific complaint. If you are taking any medicines at the time please bring details with you, together with any relevant X-ray / scan findings or test results. To diagnose your complaint accurately, a full examination will be needed. You will probably be asked to undress to your underwear for this procedure. Though, if you feel more comfortable, you can still be examined and treated partially dressed. Using expert diagnostic skills, the movement of your joints, your posture and your general mobility will be assessed. 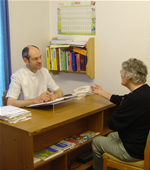 Following an evaluation and diagnosis of your condition, your proposed course of treatment will be discussed with you and, if appropriate, treatment will start during your first appointment. 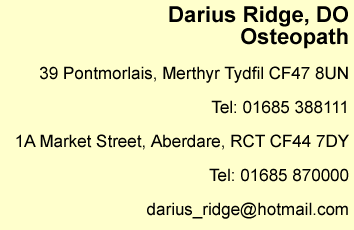 If you have any questions about your treatment, please do not hesitate to ask the Osteopath during your visit.